Organiser: The contest is hosted by National Institute of Technology Calicut. Prizes: Prizes worth 15K (8K + 5K + 2K). Registrations for prizes: Please fill in your contact details here to be eligible for prizes (only Indians) and also look for the Registration section below. 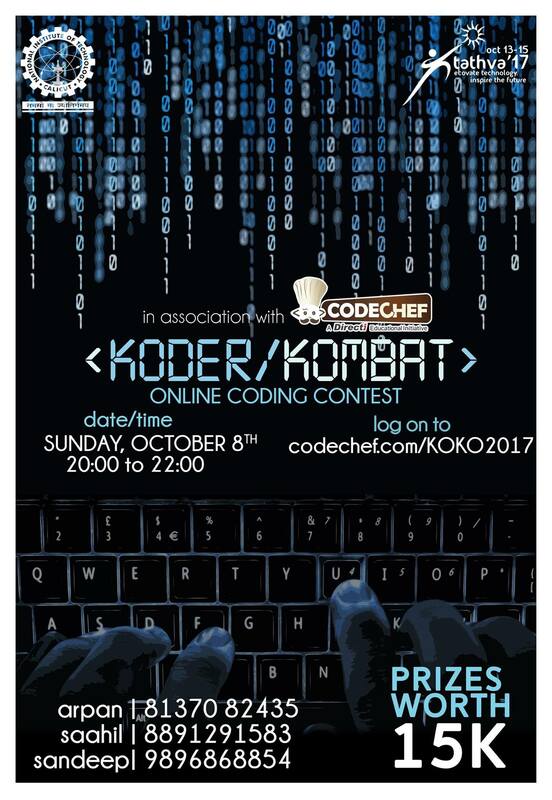 Register for KoderKombat in here. (Click on the next arrow till you get KoderKombat page). You need to have a CodeChef username to participate. If you do not have a CodeChef ID create one here. Please contact sandeepg.97@gmail.com for any queries during the contest. Image links are provided in the explanation section of KOK001 & KOK100.